I’m not mad keen on Christmas but I do love the sparkle! That means a decorated tree and ornaments. My project this month shows 2 ornaments, this time not to hang in your Christmas tree but to reside in your art journal. You can put a Christmas related quote around them or choose a quotation or song lyrics that you like as I have done. 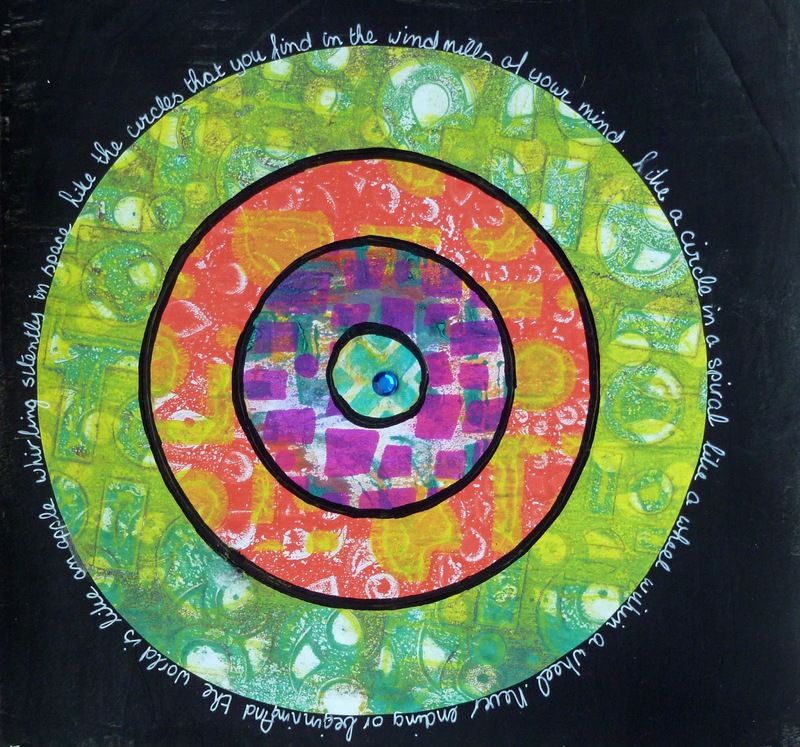 After working on last month’s Project where I used my Gelli plate to add color to the pages of my Sketchbook Project, it reminded me how much pure fun playing with the plate can be, so I decided to continue using it for this month’s project. 1. Using your 8 x 10” Gelli plate, cheap copy paper (A4 size or US letter size) and 2 colors for each page, squeeze the colors onto the plate and brayer them out, making sure not to mix them too much. You still want to see that two colors were used. Take a print. 2. 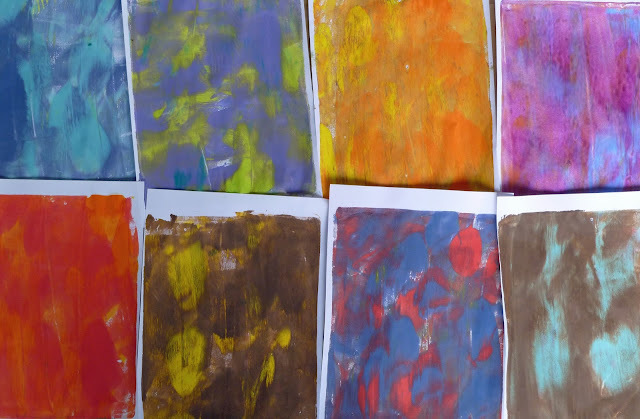 There will still be plenty of paint left on the plate so take another print with a clean piece of paper. Sometimes you can even take a third. I occasionally overprinted one second print with another. Let the pages from step 1 and 2 dry thoroughly. 3. 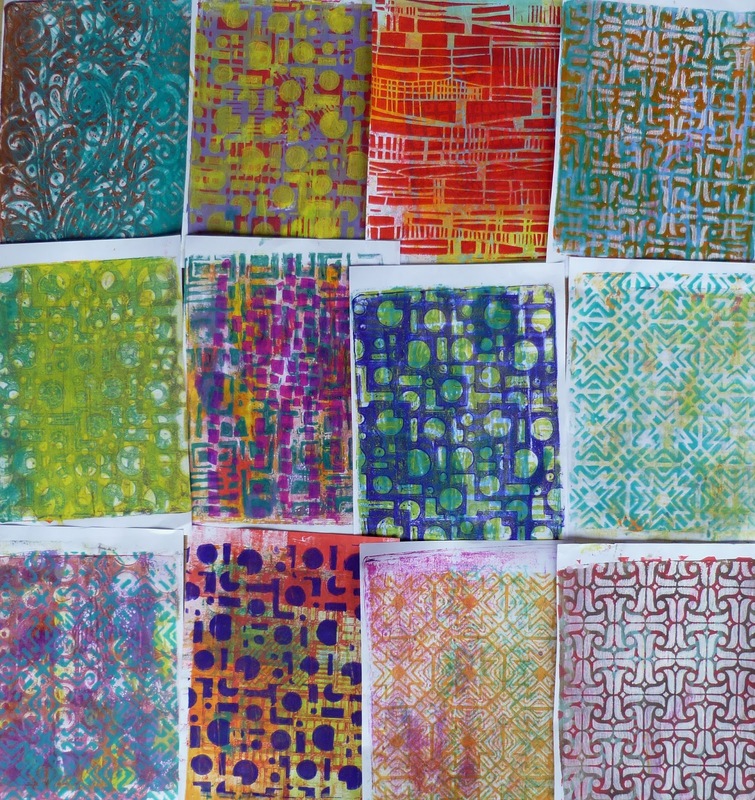 Grab a set of stencils. I used L435 Ancient Marks, the large stencil from the January 2014 StencilClub set, Mod Ovals and Circles, Buildings and Cornish Petals. Please feel free to use stencils you like best. This will work with any stencils. Add one color of paint to your Gelli plate, put one of the stencils on top, grab one of the pages made in step 1 and 2, and take a print. 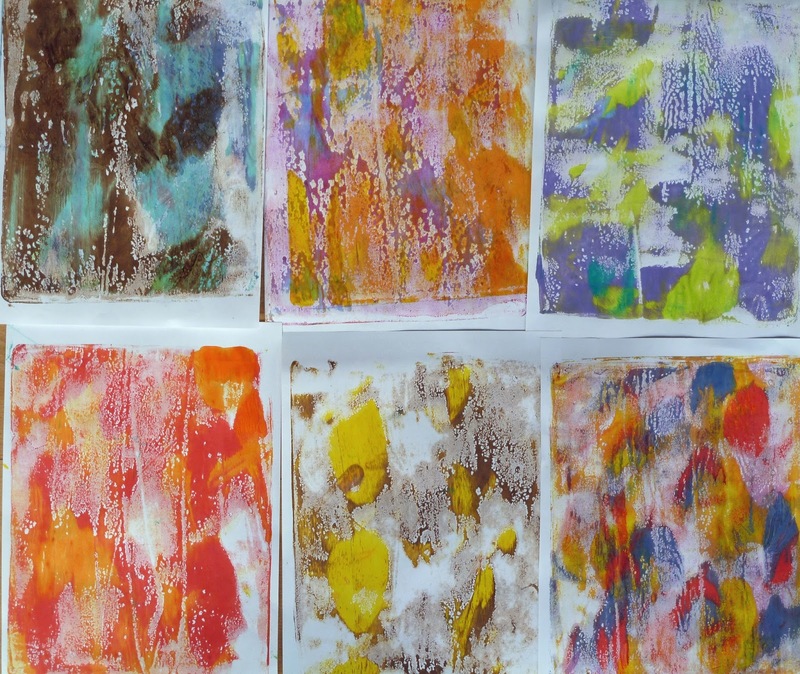 Again continue to take those ghost prints and make sure your Gelli plate is clean before using a new color of paint. Let the pages dry. 4. Use the pages from step 3 and a new set of stencils. I used the large stencil from the October 2016 StencilClub set, the large stencil from March 2016 StencilClub, Toledo, Squares and Dots 9 and Amsterdam. Repeat step 3 but with different paint colors. In the end I had about 40 pages to play with for the next step (see step 6). 5. Paint two pages in your art journal with black gesso. I used a 9 x 9” Bee Paper Company Mixed Media journal. 6. 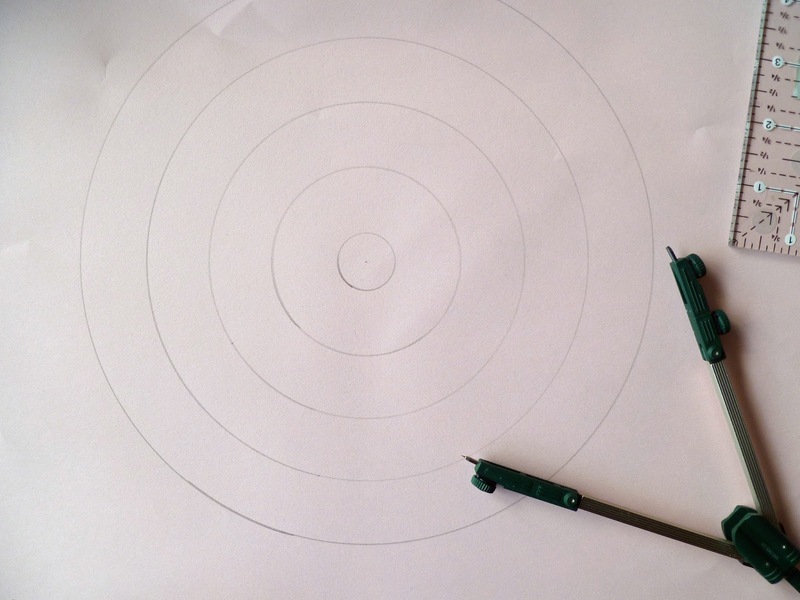 With a protractor make templates by drawing circles on a spare piece of paper. I used a radius of ½”, 1.1/2”, 2.1/2” and 3.1/2”. 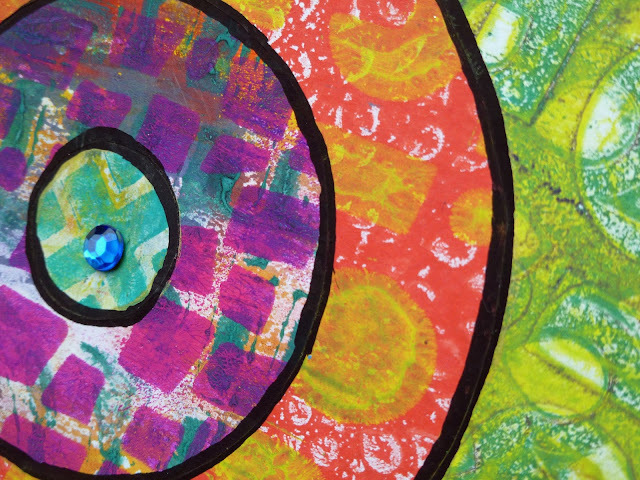 You can also draw circles directly onto your painted paper or the back of it. But using templates means you can select the area of the painted paper you want to use (this is known in the quilt world as fuzzy or fussy cutting). Cut out 2 of each of the templates. 7. 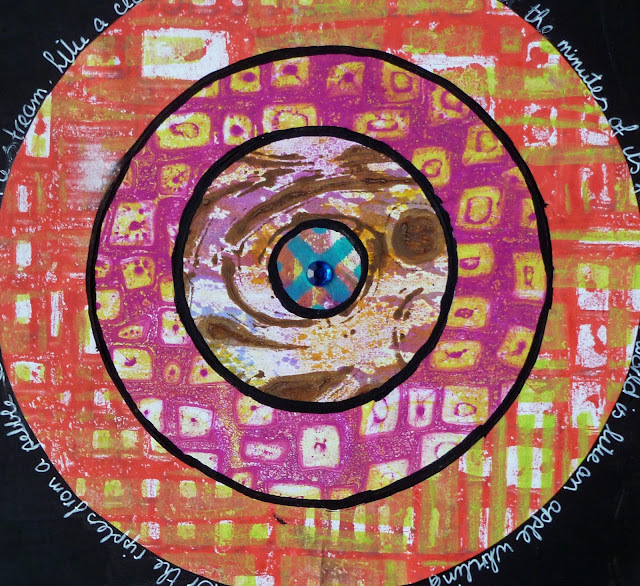 Mark the center of your art journal pages and glue on the smallest circle, followed by the other rings. I used a UHU glue stick for this step. 8. Outline each circle/ring with a black marker. I used a Sharpie medium point pen. 9. 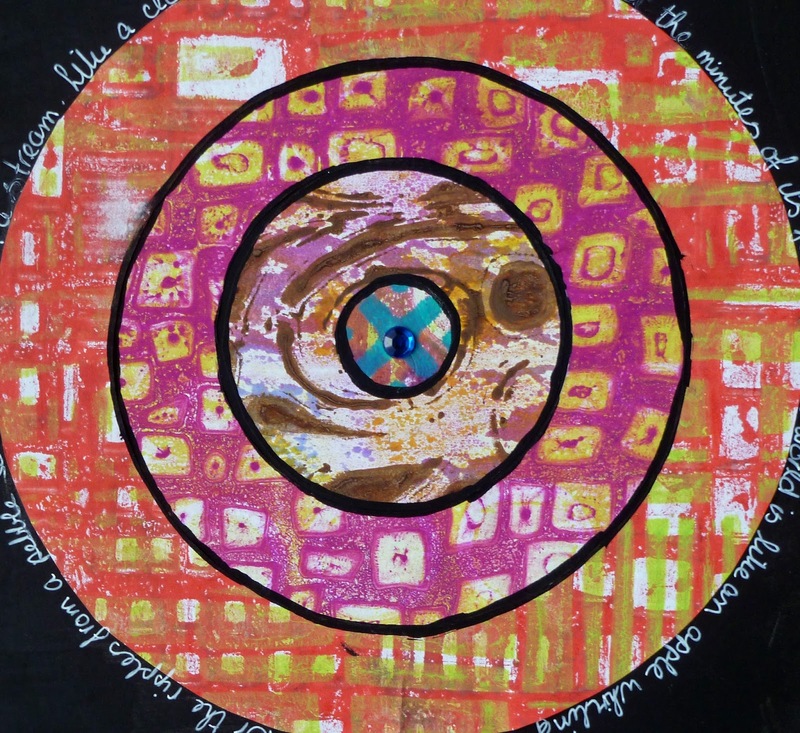 Add your chosen quotation or lyrics around the circle with a white marker. I used a Signo Uniball one. My “ornaments” were surrounded by parts of the lyrics of Dusty Springfield’s song The Windmills of your Mind. 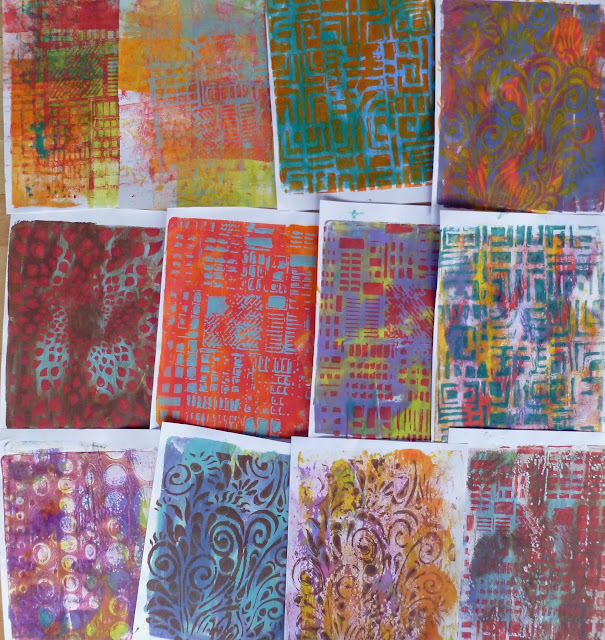 A cool way to play with the Gelli plate and Stencils!